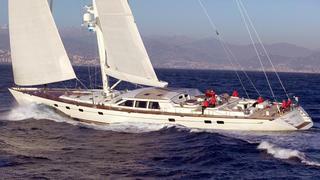 Alex Busher at Edmiston & Company in Monaco tells me he’s signed the elegant 42m sailing yacht Canica for sale. Built by Baltic Yachts in 2003, this superyacht’s spacious interior by John Munford accommodates up to nine guests in a master suite, VIP stateroom and two twin cabins plus a Pullman berth. The interior is classically styled with mahogany panelling throughout. It reflects light, warmth and the split level provides space and comfort. The raised navigation and casual dining area offer panoramic views, while the forward lower-level dining and seating areas are light and inviting. Lying in Florida, Canica is asking €11.75 million and her berth in Antibes is also available for sale.